In that decade Facebook has become one of the most used websites in the world. With its social plugins and Open Graph protocol it’s integrated its self in to the World Wide Web, and has became a leading traffic source for websites across the globe. And it’s reached these huge heights without an official user manual. Which is why you’ve been using it wrong all this time. Don’t believe me? 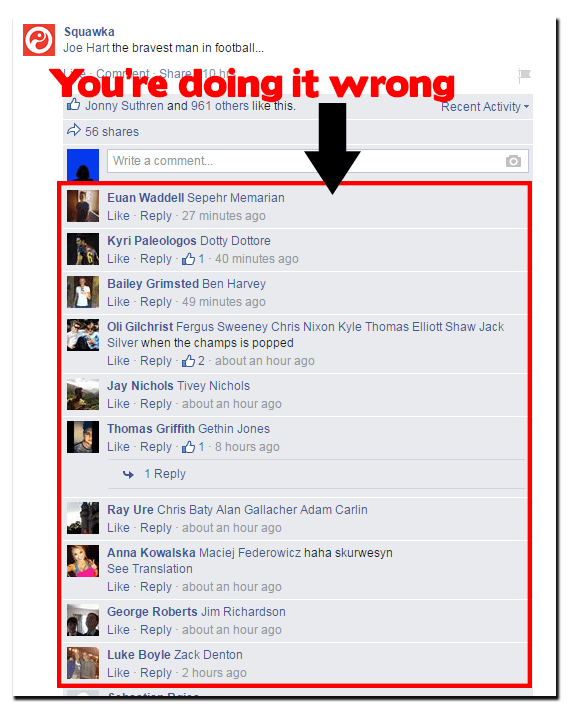 Here are just 5 ways you’re using Facebook wrong right now. So you’ve seen an amazeballslolz video of a panda sneezing on a cat’s face and you’ve just got to share it with your mate Dave who’s well in to animal sneezing. What do you do? Write Dave’s name in the comment box? YOU’RE DOING FACEBOOK WRONG. Comments are for commenting on a post. The clue is in the title. Unless the word “Dave” is your monosyllabic word of choice for providing a favourable review of something, “oh yeah that’s well Dave”, this is not the place for names. There’s a “share” button on posts for a reason. 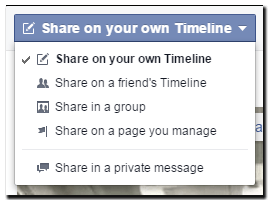 It’s for sharing things you’ve found with your friends on Facebook. Next time you see something Dave would like, try clicking “share” and see what happens. Why use one of these options instead of writing “Dave” in the comments? Because it lets you control the privacy of any conversation between you and your friends that might follow. Instead of you all agreeing how superawesomeyolo the video is then going off on a tangent about when you should next meet up for drinks so you can all look at Facebook together in the same room, on a public post, you can all agree how superawesomeyolo the video is then go off on a tangent about when you should next meet up for drinks so you can all look at Facebook together in the same room, on a post only you and your friends can see – you know, the people that need to see your social plans. 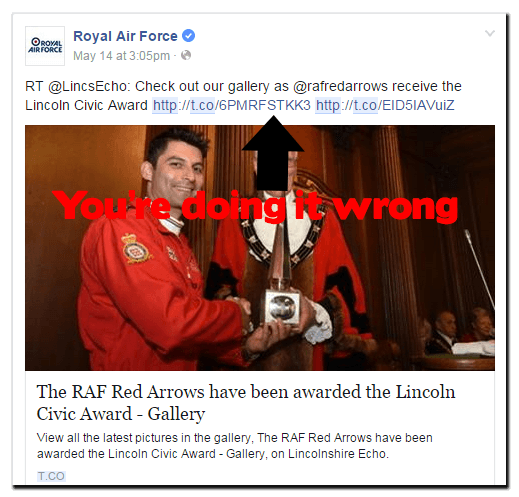 Linking your Facebook and Twitter accounts, whether personal or a business page, is just wrong. Seriously why is this still happening? 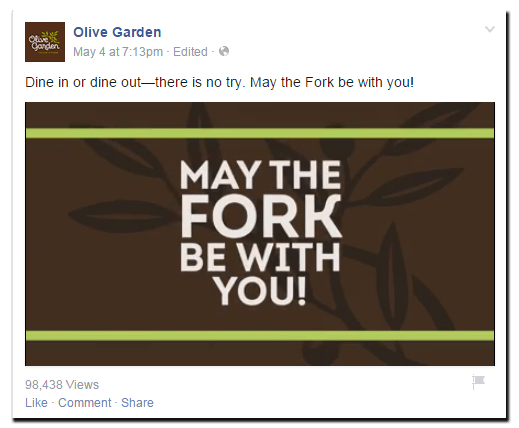 You might have heard complaints flying around about Facebook killing Organic Reach. And it’s true, Facebook pages are finding that their posts are seen by less of their fans than ever before. 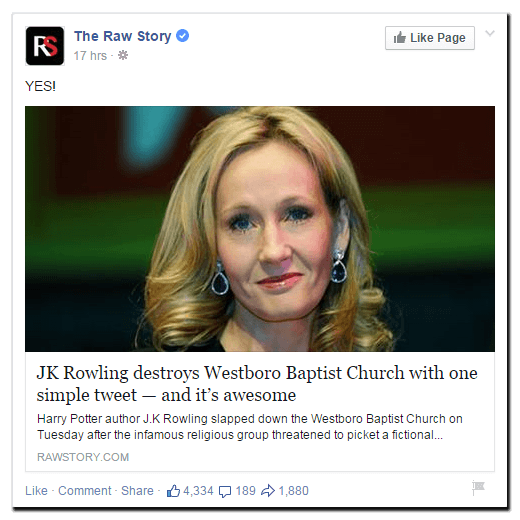 If you’ve just rolled over and let Facebook dictate what page posts you should see in your feed, you’re doing Facebook wrong. Here’s how you can make sure you never miss an update from your favourite brands trying to “join the conversation” by posting hilarious real time marketing. Just head to the page you never want to miss a thing from, and click on the “Liked” icon. This will bring up a menu where you can select to “Get Notifications”. Now every time the page makes a post to Facebook, you’ll get a notification, making sure you never ever ever ever miss out on the super important things that brand tries to sell you. It happens to all of us. You’re scrolling through your timeline on Facebook and see a must read link, but you don’t have time to click it right now because you need to get back to your desk. 15 minutes is really pushing the work poo time allowance after all. But if you just hope to remember to find the post in your feed next time you got to skive in the toilet, you’re doing Facebook wrong. 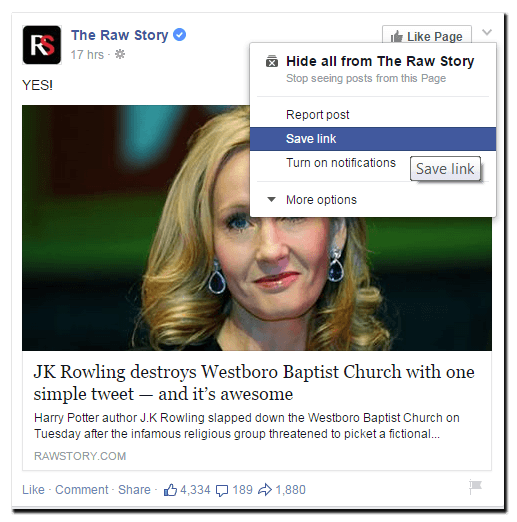 There’s a handy feature in Facebook that lets you save posts you see in the feed for consumption later. Just click the little down arrow in the top right corner of the clickbait that’s caught your eye. The post will then be added to your “Saved posts” section of the Facebook app. So now you can just stash that clickbait for reading later, like when you’re on the toilet at home. Congratulations, you’ve procreated. We get it, you’re very proud of what you created after a drunken night of fumbling 9 months ago. The miracle of birth is a wonderful thing. But lets be honest here. Out of you 1,000 Facebook friends, only 10 of them actually want to see pictures of your offspring, and one of them is your partner. The rest of us just think your pride and joy looks like a confused alien. If you’re posting photos to your entire Facebook friendlist of your child doing things that children do, like breathing, smiling or just generally not being dead, you’re doing Facebook wrong. Facebook has a new feature called “Scrapbooks“, which allow parents to create an album for their precious being and tightly control who sees their photos. You can also use Scrapbooks if you’re one of those families that has a dog/cat for a baby instead. And if you’re one of those people that spends ages complaining about people posting pictures of babies to Facebook, you’re also doing Facebook wrong. If you don’t want to see pictures of babies in your timeline, as the advert says, there’s an app for that. 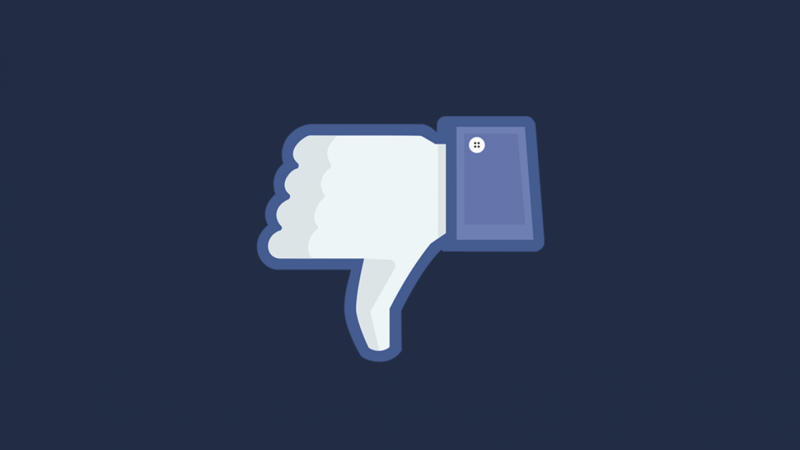 So there you go, 5 ways you’ve been using Facebook wrong. Hopefully you’ve learnt something today. As ever, comments are welcome below. And if you need any more help using Facebook, or any other social media channel, get in touch.